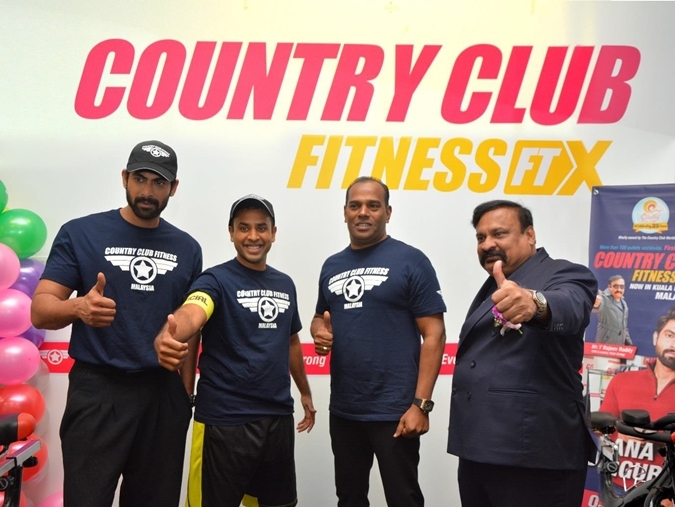 Thumbs up for the launch of the first Country Club Fitness FTX in Malaysia. Country Club Fitness FTX has recently launched its first fitness center in Malaysia. Centrally located in Bukit Bintang, it uses a unique 45-minute functional training exercise technology from Australia which offers members 9 sets of timer-based exercises specifically targeted to improve overall level of fitness. A different gym layout will be set each day, and innovative exercises will be added to the routine. The unique workout variants ensures that members will never get bored and will be kept feeling challenged. Country Club Fitness FTX features dynamic high power workouts designed to improve stamina and strength, while assisting in weight loss, toning, and flexibility. The launch event on February 3, 2016 was graced by Bollywood star Rana Daggubati as well as the Deputy Minister of Youth and Sports Malaysia, Datuk M. Saravanan. Country Club Group is known for its resort, clubbing, and fitness properties worldwide. It was founded in Hyderabad and operates primarily in India and the Middle East, with presence in Europe and Asia. Dubbed the powerhouse of entertainment, Country Club has now expanded to 100 outlets across 25 countries, and offers a full range of specialty services including 4000 holiday exchange associates, 25 trendy fitness centers, and clubbing hubs worldwide exclusive for members only. Čajdžinica Džirlo is a hidden gem in Sarajevo. Although just a hole in the wall, this small, dingy shop is a mystery waiting to be unraveled. Its interior is enchanting, made perfect with rustic murals, antique pots and jars, colorful magic carpets, and the unrestrained scent of exotic tea leaves that lingers in the air. Located on a slope of a busy street, the tea house offers curious guests a variety of specially concocted infusions. 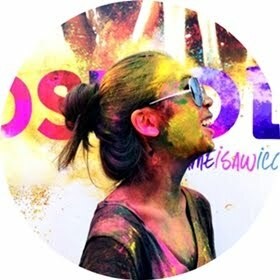 Guests will be greeted by the pair of owners with the warmest smiles, and those who are unsure about their choices can seek assistance which will be readily offered. To read more about the drink Salep, click here. Čajdžinica Džirlo is definitely a place with the most soul in Sarajevo, making it a great start for those who want to get to know the city and the locals better. Books and magazines are readily available for travelers who plan on doing nothing but sipping on good tea and lazing through the day. Salep is a must-try here, even if you have tasted the ones made in Turkey. For related travel stories, click here. Wondering what to eat in Bosnia and Herzegovina? Below is a list of the must-try local Bosnian food when traveling in Bosnia and Herzegovina! Bosnian food is rich, delicious, and surprisingly inexpensive. Its traditional cuisines are highly influenced by Turkey and the Mediterranean, which is easily noticeable through its grilled meats. Bosnian dishes are generally prepared using many different spices in moderate amounts, and are usually light as they are cooked in a lot of water. Many of its soupy dishes consist of vegetables such as potatoes, tomatoes, onions, bell peppers, and courgette, and are doused with rich, local dairy products such as kajmak and pavlaka. Ćevapis are grilled skinless sausages made out of minced meat which are traditionally found in countries located in southeastern Europe. Considered as the national dish of Bosnia and Herzegovina, it comes in variants of beef, lamb, and pork, and is highly similar to the Turkish şiş köfte. Ćevapis are usually served with a flatbread known as somun, accompanied with roughly chopped onions, kajmak, and sour cream. 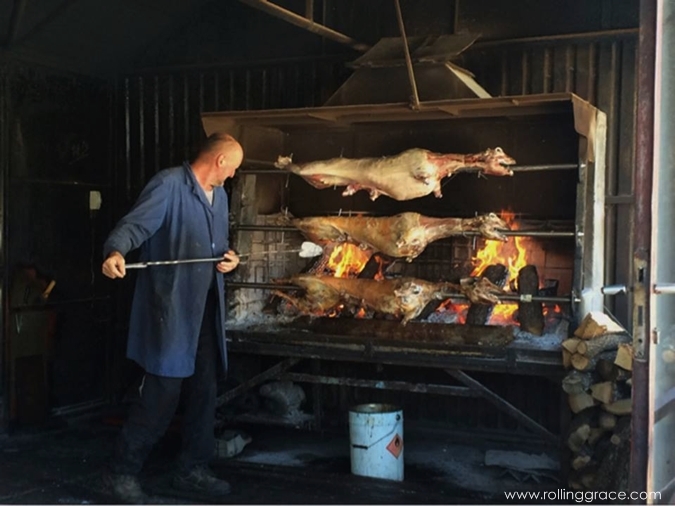 Janjetina or “lamb on a spit” is a very tasty treat where whole lambs are cooked on a spit, slowly rotated over open fire for a few hours. Meat is sold by the kilogram. Stuffed vegetables are very popular in the Balkans. Examples are Filana Paprika (bell peppers stuffed with minced meat), Sogan-dolma (onions stuffed with minced meat), Sarma (meat and rice rolled in pickled cabbage leaves), Raštika (meat and rice rolled in kale leaves), and Japrak (grape leaves stuffed with meat and rice). Begova Čorba, or Bey's soup, is a Bosnian stew dish originated from the Ottoman empire. It stands out among other soups because of two very important ingredients: okra and flour. The thick stew is cooked slowly on low heat, and is usually served with sour cream. Ćuftes are meatballs made from seasoned minced lamb or beef bound with egg and flour. They are usually served with an egg and yogurt sauce. Klepe sa mesom or minced meat dumplings is my absolute favorite dish in the whole of Balkan, which resembles the Turkish mantis and the Italian raviolis. Aside from Ćevapi, Bosnia and Herzegovina is also famous for other types of grilled meats such as Pljeskavica (spiced meat patty mixture of pork, beef and lamb) and Sudžukice (long beef sausages). Although similar in taste and consistency, the Bosnian coffee is prepared slightly differently from its Turkish counterpart. Besides that, Turkish coffee is usually served in a single cup, while the other is served in a džezva on a round iron tray along with a ceramic cup, a glass of water, sugar cubes, and rahat lokum, a type of Bosnian candy. Salep is a silky, rich and frothy drink made from a type of nutritious flour extracted from the tubers of the orchid genus Orchis. It is widely consumed in regions that were formerly part of the Ottoman empire. The drink is perfumed with rosewater and garnished with cinnamon for that fragrant, velvety taste, and is served hot. The list of must-try local Bosnian food is long, but listed above are a few of the best. Highly similar to popular Turkish food and traditional Albanian cuisines, Bosnian dishes are delicious, rich, and will leave you craving for more! For related travel articles, click here.